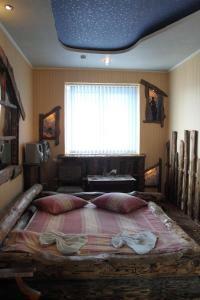 A-HOTEL.com - Luxury and cheap accommodation in Ulybyshevo, Russia. Prices and hotel, apartment booking in Ulybyshevo and surrounding. This indicative offer was derived from the most recently booked accommodation in Ulybyshevo and sort by the price, from cheapest Ulybyshevo accommodation to the most expensive hotels. To select accommodation by your preferences we recommend to choose from 2 accommodation offers in Ulybyshevo in total. By entering the dates of your overnight stay in Ulybyshevo and using the filter tools you can sort the best possible accommodation for you. The entered dates of your stay are crucial for the most accurate offer as it derives all the online information on pricing and availability of Ulybyshevo accommodation. Then you can book the selected Ulybyshevo lodging (hotels, apartments etc.) immediately. Located in a new residential area of Vladimir, this self-catering apartment offers guests a balcony with city views. Guests can enjoy free WiFi and a convenient location, close to shops and transport links, Ulitsa Nizhnyaya Dubrova Bus Stop is within a 5-minute walk from the unit. Situated 6 km from Nativity Convent and 6 km from Assumption Cathedral in Vladimir, Нижняя Дуброва 21 offers accommodation with a kitchen. Guests staying at this apartment have access to a balcony. Located in Vladimir, 5 km from Nativity Convent and 6 km from Assumption Cathedral, Apartment on Nizhnyaya Dubrova offers free WiFi. This apartment is 6 km from Palaty Museum and 4. Located in Vladimir, 5 km from Nativity Convent, 6 km from Assumption Cathedral and 6 km from Palaty Museum, Apartment Nizhnyaya Dubrova 15 features accommodation with a balcony and free WiFi. The property has city views and is 4. Situated in Vladimir, 5 km from Nativity Convent and 6 km from Assumption Cathedral, Apartamenty na NIzhney Dubrove 19 provides accommodation with amenities such as free WiFi and a flat-screen TV. This property offers access to a balcony. Apartment on 2-Ya Kol'tsevaya 31 offers accommodation in Vladimir, 5 km from Nativity Convent and 6 km from Assumption Cathedral. Housed in a building dating from 2000, this apartment is 6 km from Palaty Museum and 3. Set in Vladimir within 6 km of Nativity Convent and 7 km of Assumption Cathedral, Apartment complex with park view provides accommodation with free WiFi, a flat-screen TV and a kitchen. There is a fully equipped private bathroom with shower and free toiletries.